I love glitter. I can't get enough. I even decked out a pair of shoes in glitter, you can read about it at the Sparkle Shoes post. I've seen all over Pinterest photos of candles + glitter. I found a great tutorial for this craft on Momtastic. And no - you don't need to point out that I am not yet a mom but sometimes wander over to Momtastic. I gathered the following supplies and got started. I wrapped the upper portion of both candles in masking tape. I made sure that the bottom line was completely straight. 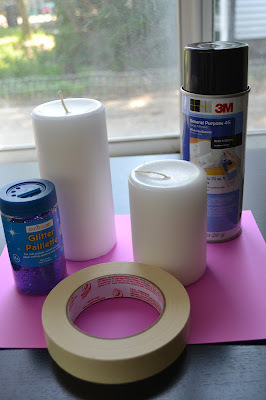 Next, I sprayed the exposed portion of the candle with spray adhesive and dumped glitter all over it. This made a huge glitter mess. The spray adhesive went everywhere including all over my fingers. You can imagine how dealing with glitter and sticky fingers was. I waited about an hour before I removed the masking tape. When I did remove the masking tape - it pulled a little too much glitter in a few sections. Lastly I sprayed the candle with a clear coat of spray paint to set the remaining glitter. 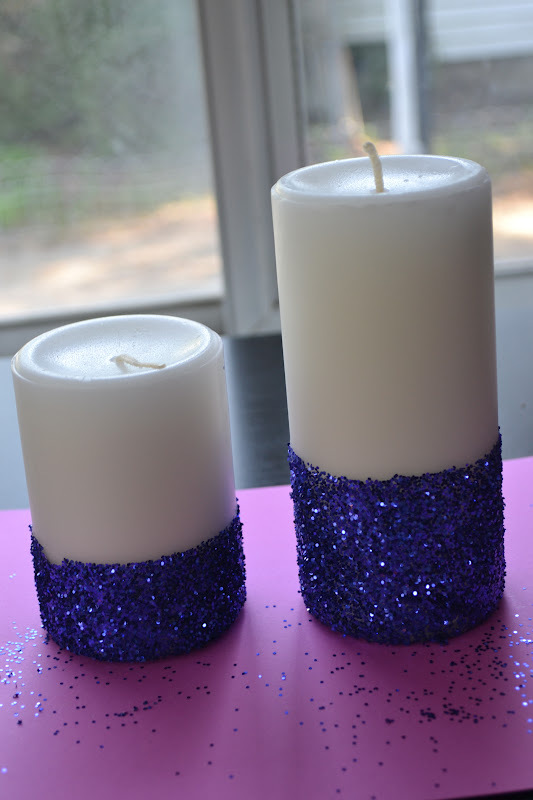 I love the glitter candles! Even with the huge mess- they turned out really great! This is definitely an easy craft! Just be prepared to have glitter everywhere. If you live with someone who HATES glitter - do not attempt this craft.